From our “Dustbin of History” files, here’s the harrowing tale of a little-known milestone in aviation history. 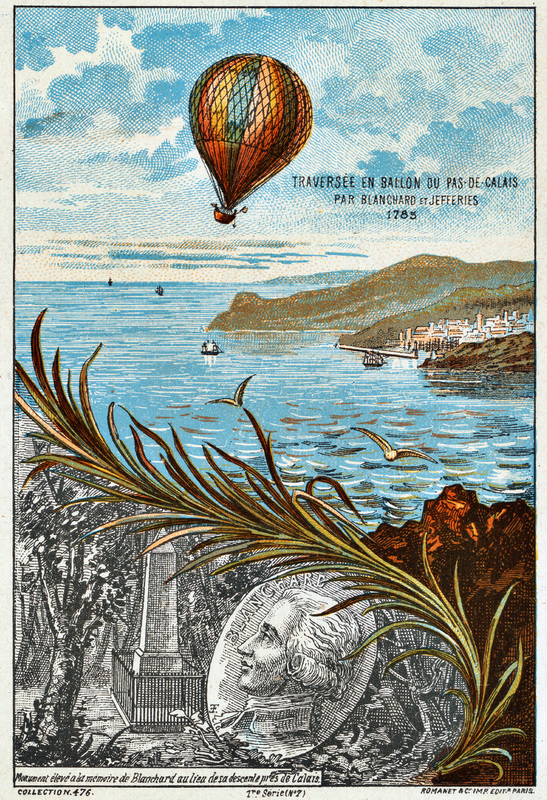 It was January 7, 1785, and two men were preparing for the first ever balloon crossing of the English Channel. The one who financed the adventure was John Jeffries, a well-to-do American doctor. The one with the aviation skills was Frenchman Jean-Pierre Blanchard, one of the innovators of ballooning—which at that point had only been around for two years. A crowd gathered near the Dover cliffs to watch them lift off for France. At 1:00 p.m., Blanchard and Jeffries embarked on their 21-mile journey. But there was one problem: They were too heavy. They were carrying 30 pounds of ballast weights (used to keep the balloon steady), plus steering gear, personal items, a bag of mail to be delivered in France, and scientific equipment. And then there were the four “wings.” Made out of silk and extending from the carriage, they served no real purpose except to make the balloon look like a bird. Only a few miles into the crossing, it was apparent that the balloon was flying too low. The Channel loomed close, and neither man could swim. Their only option: lose some weight. First went the ballast bags, but the balloon didn’t rise. As the carriage skimmed 20 or so feet above the surface, Blanchard unhooked the wings and let them drop into the water. The men argued over what to throw off next, finally deciding on the bag of mail. But the balloon was still flying too low. Then went the bottle of brandy they were saving for the landing. Still too low. Then, much to Jeffries’ dismay, went his thermometer, his barometer, and his telescope. Still too low. So Blanchard stripped off his clothes—his heavy overcoat, his pants and shirt, then everything else, and he urged Jeffries to do the same. But the doctor was too dignified to land in France completely naked, and only stripped down to his undergarments. And they were still dangerously close to the water. Perhaps he was right—peeing into the Channel may have saved them from crashing into the Channel, but the fact remained that they were still flying too low. When the bottom of the carriage actually touched the water, Jeffries panicked and started climbing up the ropes. Blanchard yelled for him to come down; he was making it even more unstable. Jeffries climbed down; the two men put on their cork life jackets. They braced for impact. But the cold was the least of their troubles—all of Blanchard’s steering equipment and anchors had been thrown overboard, leaving him no way to control the craft. They could only watch in horror as the balloon got caught in a downdraft and headed straight for Fel-mores Forest. Luckily, just above the canopy, they leveled out and Jeffries was able to grab hold of the top of a tall tree and slow them down. The carriage unceremoniously flopped into a clearing, with the silk balloon still caught in the branches. Some farmers gave them clothes and a ride to the town of Calais, where another crowd had gathered to witness the historic landing. Jeffries had kept one letter—in his underwear—from the jettisoned mailbag. It was addressed to Benjamin Franklin (serving as American Ambassador to France) from Franklin’s son. That was the first airmail-delivered letter in history. Blanchard went on to become the first man to fly a balloon in several countries, including the U.S., where George Washington and two future presidents were in attendance. In 1809, at 56 years old, Blanchard was ballooning over the Netherlands when he suffered a heart attack and fell 50 feet to the ground. Though he never recovered, he’d met his end doing what he loved. This article is reprinted with permission from Uncle John’s Endlessly Engrossing Bathroom Reader. 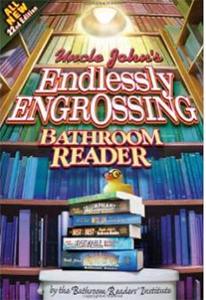 This 22nd edition of the wildly popular Uncle John’s Bathroom Reader series is jam-packed with their trademark mix of humor and interesting facts. Where else could you learn about the lost cloud people of Peru, the world’s first detective, and the history of surfing?